It's Bound To Be Great Week at Booktryst. 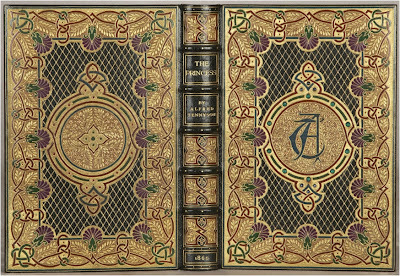 Each day, we'll post a story devoted to some of the most spectacular book bindings you'll ever see. As jaws will drop and drool will, uh, drool, you may wish to don a bib before proceeding to read. As drooling has continued to be an issue for me since the playpen era I routinely wear one for all occasions. I have a few. They're emblazoned, My Other Bib is a Hugo Boss; I Can't Wait To Learn How To Read; and, natch, I Burp For Fine Bindings. LACTANTIUS. Des Divines Institutions Contre les Gentils & Idolatres. (Lyon: Imprimé par Balthazar Arnoullet [pour] Guillaume Gaseau, 1547). The contemporary French binding above is in the entrelac (interlaced) style and is an enchanting example of French Renaissance refinement. 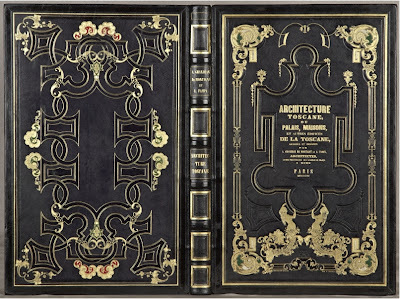 The covers feature a complex strapwork pattern tooled in gilt and painted black and white, the design comprising borders, interlaced squares, and complex scalloped and spade-like panels, with a green-painted oval at the center, the original flat spine (remounted in the 19th century and with small restorations) diapered, with each lozenge enclosing a thick dot, all edges gilt. 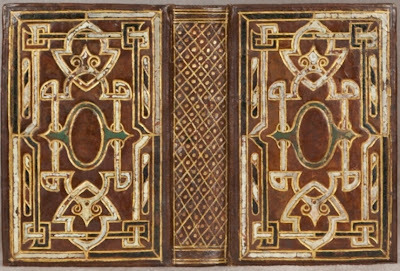 This binding likely originated in Lyon, where many of the best entrelac bindings were executed during the reigns of Francis I and Henry II. Influenced by Islamic models, entrelac decoration made its way through Italy and into southern France, where it adorned some of the finest bindings of the period. During this time, the use, as here, of painted inlays or onlays was considered to be the height of French bibliopegic fashion and one of the most charming manifestations of the elegance of the Renaissance in France. 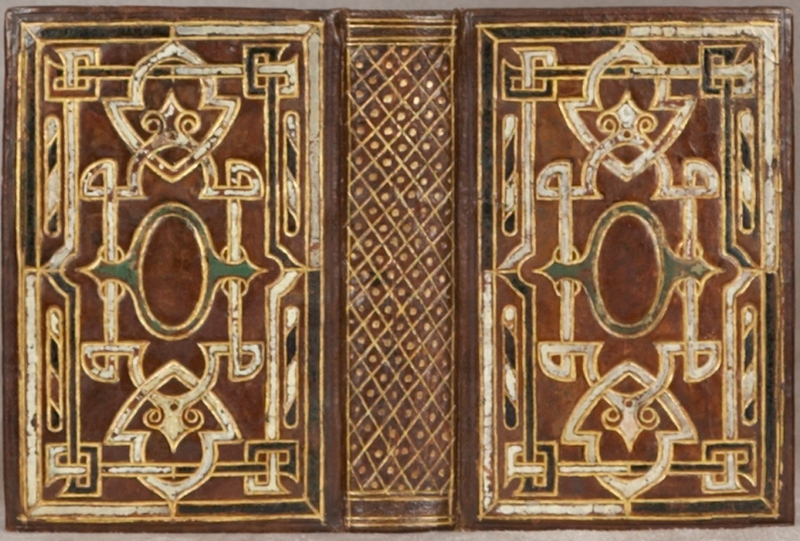 Goldschmidt, for example, calls these bindings "great artistic creations" that represent "the highest achievements in the art of bookbinding in the Renaissance period." Best Songs and Lyrical Poems in the English Language. Binding by John Ramage, c. 1867. This lovely contemporary, ornately gilt and inlaid scarlet morocco binding by John Ramage features covers with a wide and very intricately gilt frame bordered by plain and dotted rules, the frame of alternating inlaid green and brown morocco (the former pyramid shapes, the latter strapwork quatrefoils), the whole densely tooled in gilt, central panel with floral cornerpieces, raised bands, spine lavishly gilt with the quatrefoils repeated as centerpieces against a ground of many small tools, turns-ins attractively gilt, ivory watered silk endleaves, all edges gilt. Born in London in 1836, John Ramage served an apprenticeship with John Wright, then went to Paris, where he was able to work with the distinguished Marcellin Lortic (1822-1892), who opened his shop on the Rue St. Honoré in 1840. 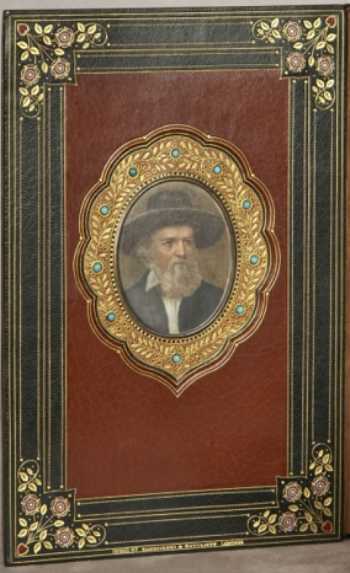 In 1860 Ramage purchased the binding business of Alexander Banks, Jr., in Edinburgh, then returned three years later to London, where he was in business at various locations into the 20th century. Though the range of their designs is broad, Ramage bindings are celebrated for their remarkably delicate, careful, and elaborate gilt work. Reversis. In Quibus Tractatve de re Navali. [and three other works]. Contemporary binding by the Dudley Binder (?). The striking, heavily gilt sixteenth century English calf binding above features covers gilt with a border formed by two plain rules flanking a floral roll, the frame enclosing a central field of many tiny star tools, intricate strapwork cornerpieces, and large central arabesque composed of strapwork interspersed with lilies and volutes; flat spine divided into latticed gilt panels by double plain rules and floral bands. 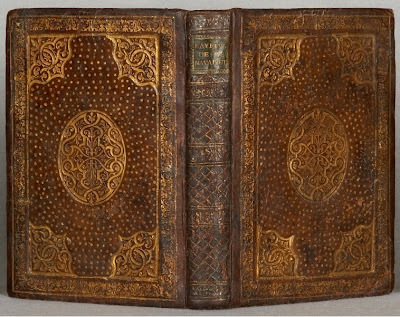 It's a lovely 16th century English decorative binding similar to the work of the artist whom Nixon dubbed the "Dudley Binder," for the work he did for Robert Dudley, Earl of Leicester. The central panel, with its oval medallion and ornate cornerpieces, is typical of the Dudley Binder's work (see, for example, items #16 and 17 in Nixon's Five Centuries and Foot's Davis Gift, #43). Paris: Librarie L. Conquet, 1887. This beautiful, elaborately gilt and inlaid contemporary beige crushed morocco by Gruel features covers with an outer frame of multiple strips of ochre and turquoise morocco outlined in gilt enclosing a large beige panel in the form of a Moorish-style window with pointed arch top, inlaid with 14 pink morocco rosettes and 39 lotus blossoms in two shades of blue morocco. 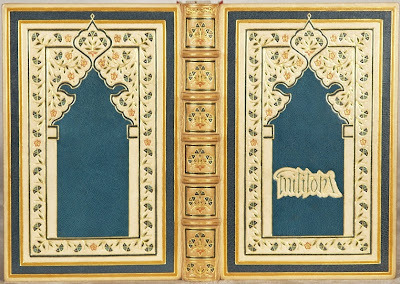 The window opens onto a panel of turquoise morocco, with the title inlaid in beige and blue morocco on the upper cover. Raised bands, compartments framed by turquoise morocco and containing a spray of inlaid lotus blossoms, turn-ins with turquoise and gilt-rule frame, pastedowns of tangerine silk, free endleaves of scarlet silk, and all edges gilt finish this distinctive binding. Gruel was one of the most famous and important "fin de siècle" French binders. In her Bookbinders and their Craft, Prideaux says that the Gruel firm, founded in 1811, "always had the highest reputation . . . for initiative in artistic matters, as well as for irreproachable execution in the detail of its many-sided achievements." The list of binders who trained at the Gruel atelier is the most distinguished in Europe. Léon Gruel (1841-1923), who took over the firm in 1891, was the single most famous person associated with the bindery. He led the campaign for acceptance of revolutionary ideas in the decoration of modern bindings. The Moorish-influenced architecture of Spain has inspired this Gruel binding, and there are elements of Art Nouveau in the design, particularly in the floral decoration. The binding is animated and delicate in design as well as flawlessly executed. Toscane, ou Palais, Maisons, et Autres Edifices de la Toscane. Paris: P. Didot l'Ainé, 1815. 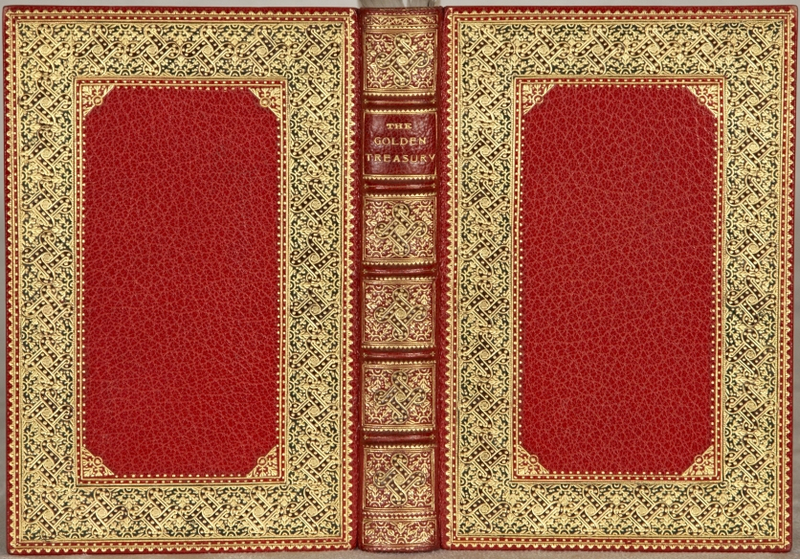 19th C. binding by F. Hromada. This highly dramatic, elaborately decorated in gilt and blind, inlaid and painted by F. Hromada features an upper cover with thick- and thin-ruled gilt and black borders enclosing an elegant frame with shell-like cornerpieces formed by gilt and inlays painted green and white, the frame enclosing a large central title cartouche supported by two lovely gilded mermaids emerging from a foamy spray. The lower cover has intricate inlaid strapwork in black extending the length of the cover, floral gilt cornerpieces, inlaid red and green morocco ornaments (at the middle of each side), and azured gilt decoration at various locations. Raised bands, spine gilt in thick- and thin-ruled compartments, multiple-ruled gilt turn-ins, all edges gilt, and leather hinges complete this marvelous work. Francisco (Frantisek) Hromada was a Czech active as a gilder in Valparaiso, Chile from about 1858 onward. According to Holley and Espinosa, Hromada was, with Adolfo Boehme and Enrique Ahrens, one of the most distinguished Chilean binders of his day. While this large-format binding may (or may not) have been produced in Chile, it is very much in the European style, with strong Romantic elements (even if it was produced closer to 1850 than 1800). Whenever it was done, this unusually animated and imaginative binding bursts with elegant energy. GESSNER, Salomon. La Mort d'Abel. Paris: Defer de Maisoneuve, 1793. 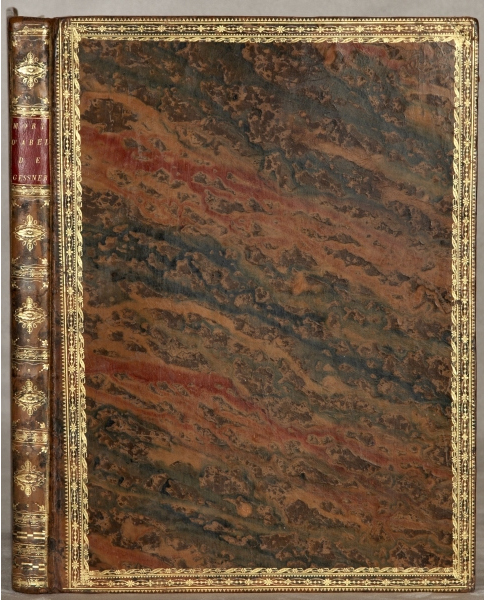 This striking, contemporary marbled calf binding features covers with prominent red and green diagonal flaming streaks and frames of multiple elegantly decorative gilt rolls, a flat spine divided into compartments by plain and decorative gilt rules with each compartment ornamented with fleuron cornerpieces and large centerpiece formed by a patera within a scrolled collar, a red morocco label, gilt turn-ins, marbled endpapers, and all edges gilt. 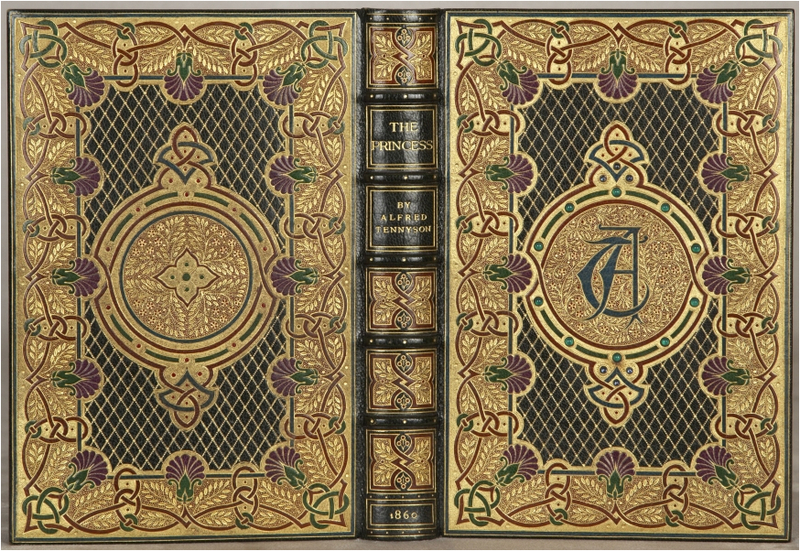 The binding, with its unusually beautiful colored marbling, is of more than passing interest: even though internally this is a most attractive book, it appeared at a troubled time when buyers would have been inclined not to spend money on expensive bindings, so to find this book in a particularly handsome contemporary binding is good fortune, indeed. TENNYSON, Alfred. The Princess: A Medley. London: Edward Moxon and Co., 1860. 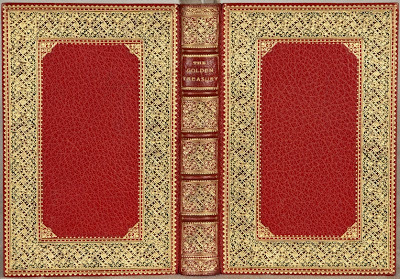 Later jeweled binding by Sangorski & Sutcliffe. Sumptuously bound in dark green morocco, densely gilt, intricately inlaid, and adorned with jewels by Sangorski & Sutcliffe, this binding features covers with a diapered central panel enclosed by a wide and ornate frame of inlaid brown and green strapwork on a heavily stippled gilt ground accented with leafy fronds of gold, the inner edge of the frame punctuated at the corners and on the sides by a dozen lotus blossoms of purple and green morocco. The upper cover possesses a central medallion framed by green, blue, and brown strapwork with knots at the head and foot adorned with a total of six cabochon sapphires, and the frame itself is set with ten cabochon emeralds. The medallion is filled with swirling gilt vines, tiny red morocco berries, and flowers on a very densely stippled ground, the whole with a dramatically superimposed "A T" monogram of inlaid green morocco at the center. The lower cover has a similar central medallion in which red dots of inlaid morocco replace of the gemstones, and the centerpiece is a gilt quatrefoil with inlaid circles of green morocco. 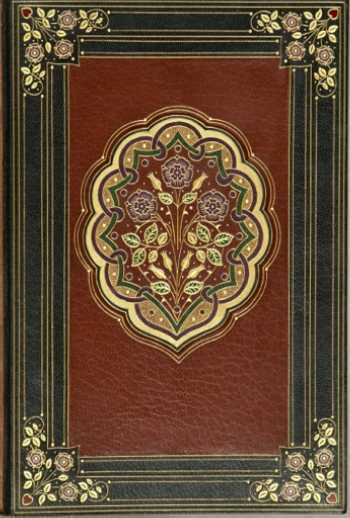 Raised bands, compartments richly gilt with inlaid brown strapwork, gilt leaves, red morocco berries, and much gilt stippling finish the outer covers of this binding extravaganza. Inside are chestnut brown morocco doublures within a wide green morocco frame decorated with plain and dotted gilt rules and floral spray cornerpieces of inlaid lavender flowers, red hearts, and gilt rose leaves. The panel of the front doublure has a sunken scalloped oval medallion containing a portrait of Tennyson on ivory under glass encircled by a wide, thickly gilt collar with ten cabochon turquioses. The rear doublure possesses a similar sunken panel featuring a large floral spray of roses and tulips in gilt and inlaid morocco within an inlaid strapwork frame, the whole surrounded by a wide band of heavy gilt. The endleaves are of brown moire-silk. Painted, gilt, and gauffered fore edge. As if that weren't enough, all edges have been gilt, gauffered, and painted in a delicate diapered floral pattern. My bib is sopping wet. Tuesday: The Guild of Women Binders, Bound To Be Great. Wednesday: More Magnificent Bindings, Bound To Be Great. Thursday: The $65,000 Binding, Bound To Be Great. All images courtesy of Phillip J. Pirages Fine Books, currently offering these books through their just published Catalog 61: Historically Significant and Decorative Bindings 1536-2010, a magnificent production, and an instant and important reference source. This post impossible without the assistance of Pirages' head cataloger and Booktryst contributor, Cokie G. Anderson. Five Great 20th Century Bindings. Five Must-See Modern French Bindings. A Royal (Roger) Payne in the Binding. Search our archives under "bindings" to find more fascinating and visually stunning posts on the subject.